Maybe you have already heard of delights of Hungarian cuisine. 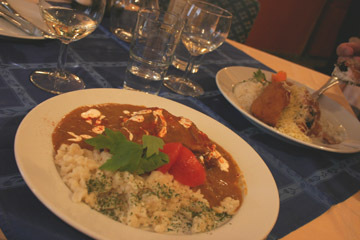 The traditional Hungarian dishes abound in piquant flavors and aromas. 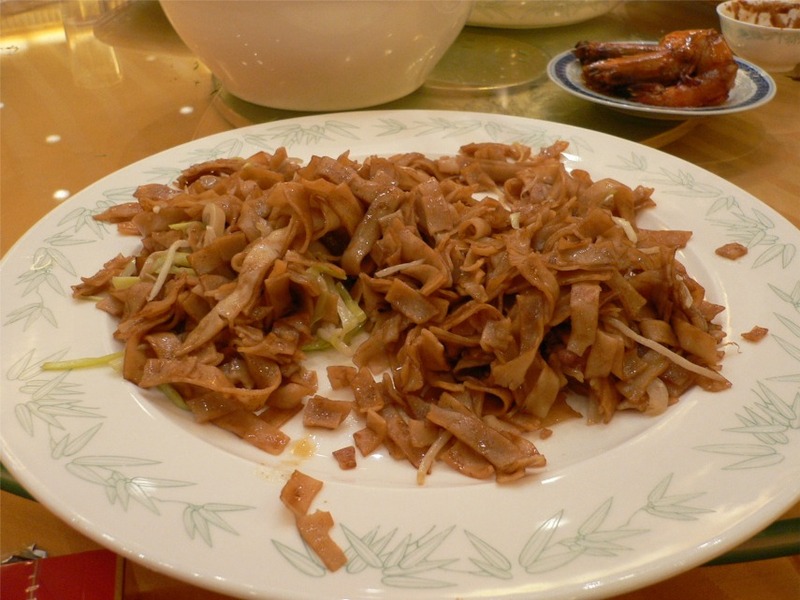 Dishes are flavourful, spicy and often rather heavy. People with a sensitive stomach, should be careful. Flavours of Hungarian dishes are based on centuries old traditions in spicing and preparation methods. The exquisite ingredients are produced by local agriculture and husbandry. Paprika and garlic is to be found everywhere. In the autumn, a fascinating view is the strings of red paprika (unground red pepper) hung on the white walls of the houses in the neighbourhood of Kalocsa, a town along the Danube. 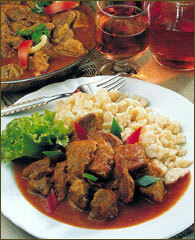 Hungary is known for its exotic, tasty and spicy food and delicious wine. What is different about Hungarian cooking? In general, the preference is for rich and spicy sauces, stews and sweets over rather "drier" dishes. In particular, the liberal use of a few special ingredients which give it its own inimitable and original flavour. These are first of all red pepper, fresh green peppers and tomatoes, sour cream and lard. 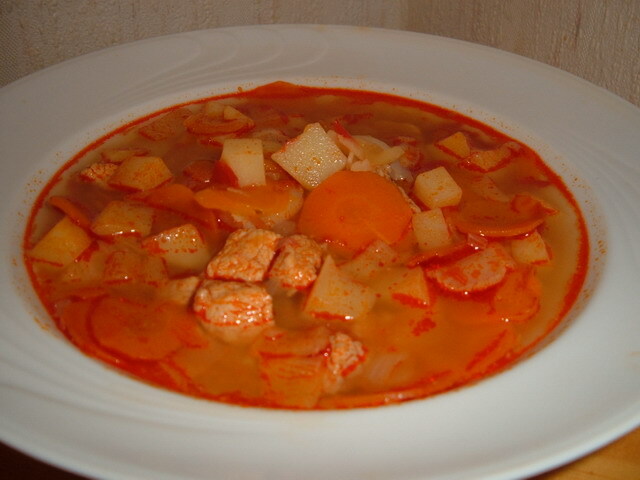 The use of lard or goose-fat instead of other forms of fat for cooking is traditional and certainly typical but nowadays more and more Hungarians are worried about the cholesterol content of lard, so often other fats are substituted The most well-known specialities of the Hungarian cuisine such as goulash soup, the different varieties of stew etc. are red with paprika. It should be noted that dishes flavoured with paprika need not be hot. In fact, some of the finest brands of paprika are not strong at all. Fresh green peppers and tomatoes are also frequently used to flavour these dishes, the essence of which is the same: braise any kind of meat in lard/oil with onions, and season it richly with red pepper. 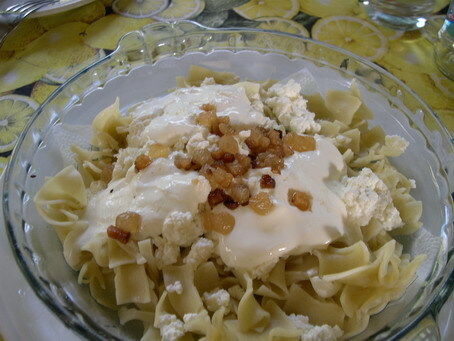 Sour Cream is an essential ingredient in many Hungarian dishes too. It is a basic ingredient of paprikash (any kind of meat or just plain potatoes prepared in paprika sauce, to which sour cream has been added), as well as in many Hungarian vegetable dishes and casserole stews. The use of pastas for desserts like noodles with cottage-cheese, or egg squares with fried cabbage etc. 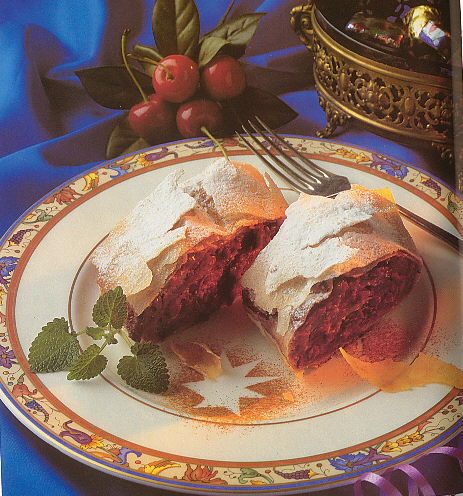 – especially as sweets with sugared nuts, poppy seeds, fruit jellies or jam – is probably peculiar to Hungary. A real Hungarian speciality, the strudel is a firm favourite even with people who don not like pastry or sweets as a rule. It is no wonder, because its dominant flavour is given by the various fillings, savoury or sweet, while the pastry itself – light and crispy – only underlines their delicacy. For filling there are used fresh fruits such as apples and cherries, cottage cheese, cabbage, rice as well as poppy seeds. Noodle dishes with cheese like sztrapacska go well with fish dishes. Look out for langos, fried dough eaten with garlic, salt, cheese and sour cream. It is a very popular snack. Hungary is also a land of delicious wine. The most famous Hungarian wine is the world renowned Tokaji Aszú, known as Vinum regum, rex vinorum (Wine of kings, king of wines). Tokaji (Tokay) is undoubtedly the most splendid drink produced in Hungary but the red wines which comes from vicinity of Eger are no less reputable: Egri Bikavér and Medoc Noir. Hungary also produces lovely muscatels, rieslings such as the white wines of the Balaton region: Badacsony Riesling, Kéknyelű, Szürkebarát.